Finishing touch: Glitter, metallic ribbons, little bows, some metallic paint on the hem – find a festive twist! 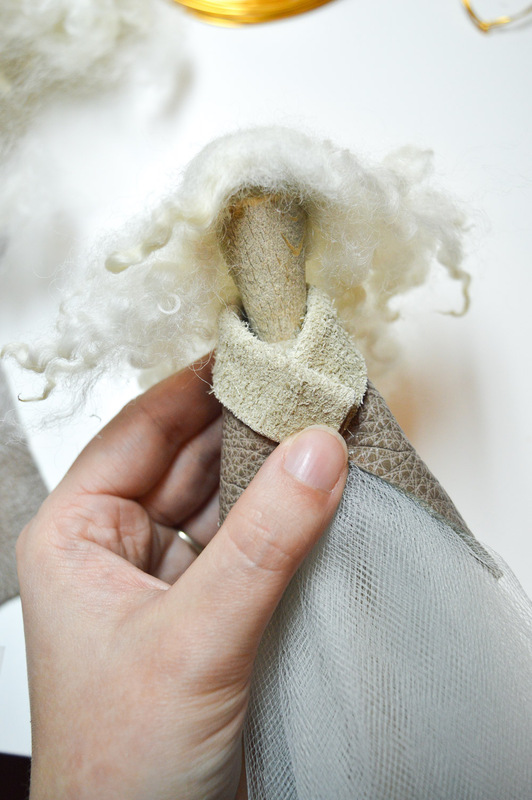 This project is so fun and flexible, you can dig through your stash or the local craft shop’s bargain bin to make something entirely your own. 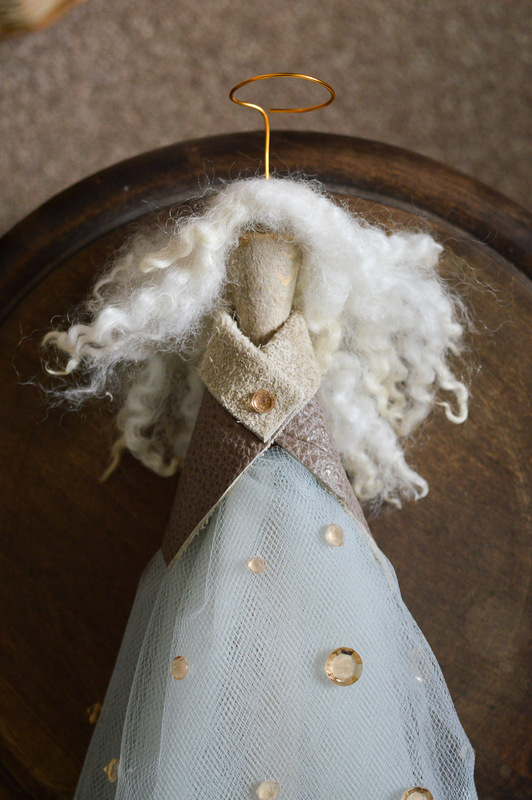 Because it was central to my angel, I started with the hair. 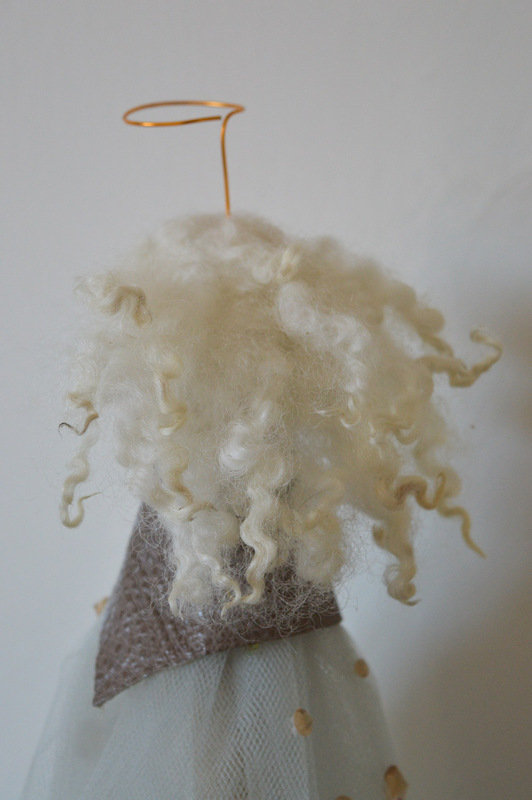 In hindsight, it might be easier to do the clothes first as the hair might get in the way at the end! But this is the order I did it in, and took pictures in. 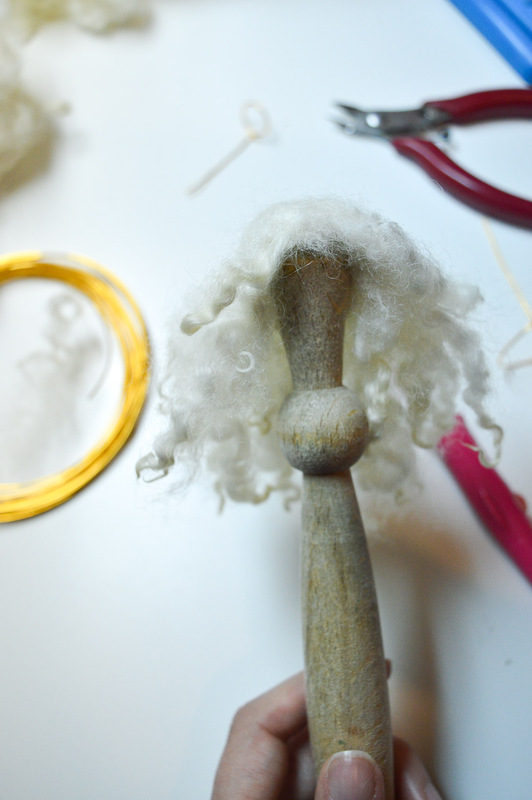 To get the hair started, I cut off a tiny bit of felt to start felting the curls onto. 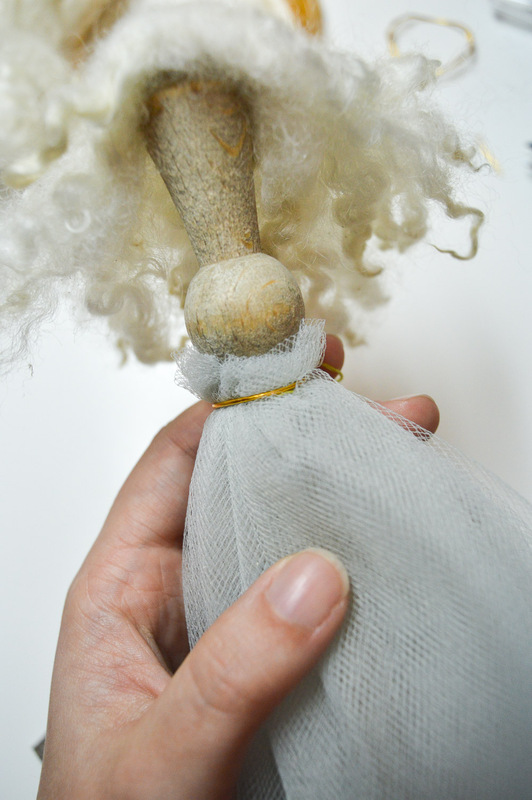 The felt piece was hidden entirely by the time the hair was done. I used white felt so it was easier to cover up. 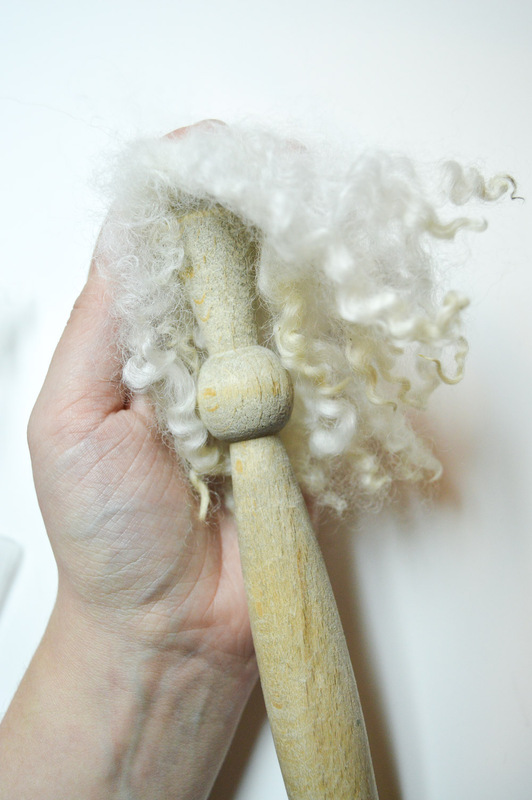 After felting most of the hair, I started felting with it on the spurtle to give it better shape. 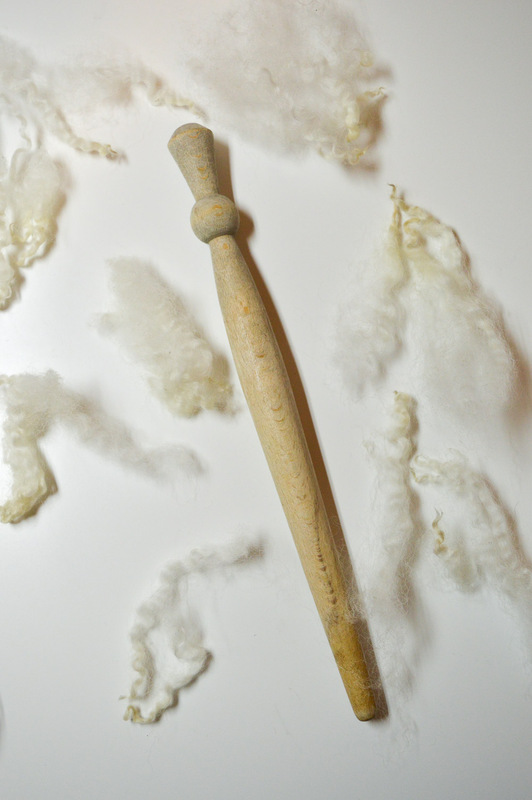 Work carefully, so you don’t stab your fingers or break the needle on the wood. 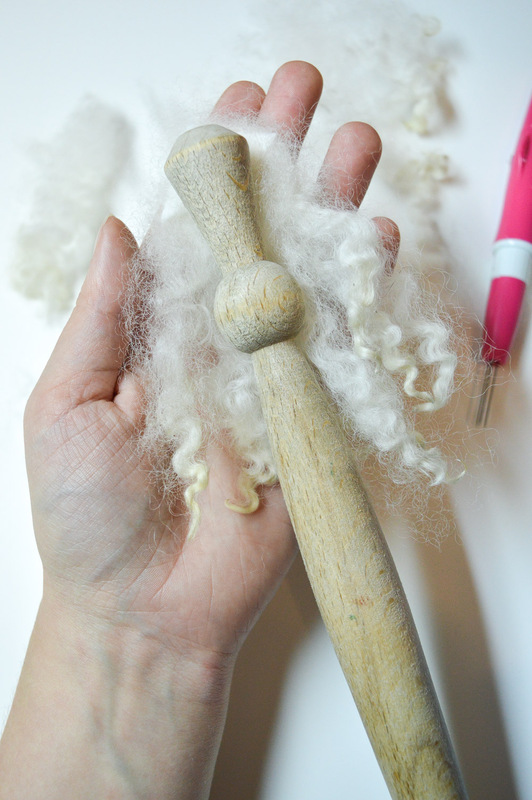 I shaped the work by felting straight from above around the edge of the spurtle, so it laid flatter against the head. When the hair was ready, the section underneath was solid enough that I simply used superglue on the wood (a thin layer all over the contact areas) and held the hair in place for a minute to let it settle. Voila! 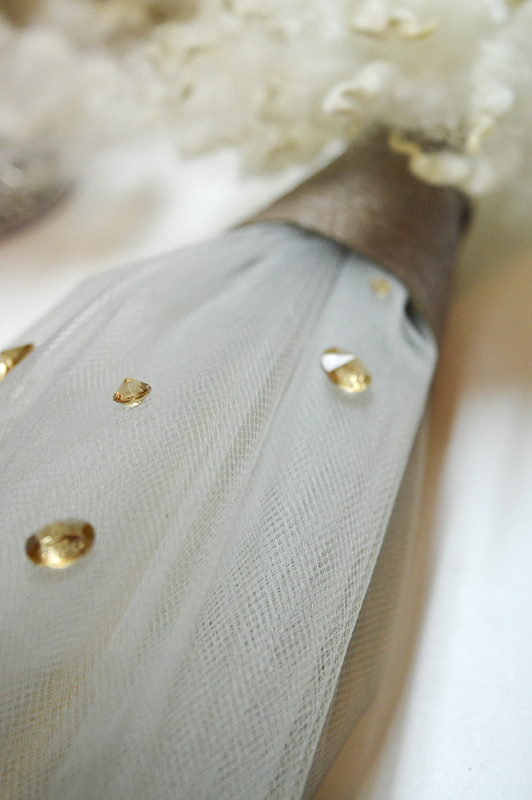 The tulle piece was folded into quarters so it left a small section of the spurtle easy to hold. I used some thread to gather the fabric using running stitch, and tightened it in place. After tying the thread, I wrapped the top with a length of wire to hold it more securely. In my angel this gathered section will be covered, but you could leave it at just the skirt and paint the chest instead! About 1cm of the leather was folded back and glued flat to create a collar. I started with a rectangle longer than it needed to be, and measured it to length by wrapping it around the body. Where the leather aligned, I cut it to shape. I then glued it in place where the collars meet. The finishing touch! Rhinestones! The subtle amber sparkle was perfect for the earthy look, and was the final ingredient to make her festive. 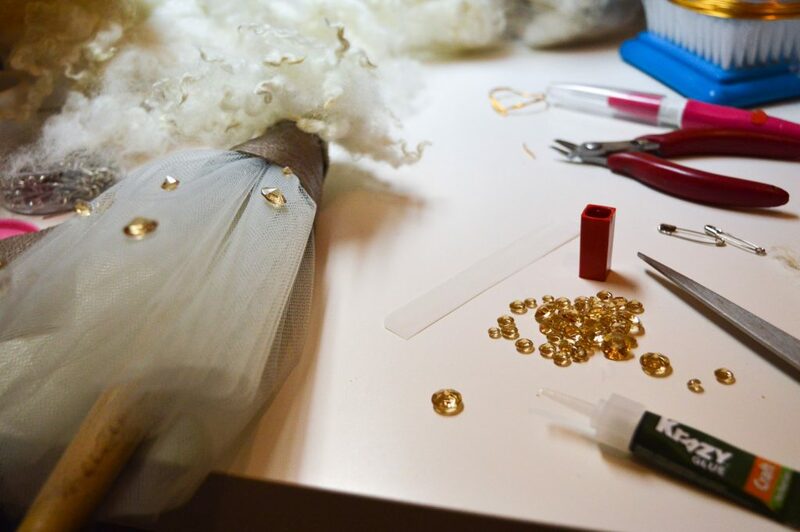 I used superglue on the flat back of each rhinestone and carefully laid it in place on the tulle. I let each section set for 20 minutes before turning the angel to work on the next section. I learnt my lesson – the first time I tried to turn her the glue wasn’t ready. It wasn’t fun cleaning the glue off the carpet after the rhinestones fell off! On that note, maybe it’s a good idea to cover the table and perhaps the floor before you start working. Oops! 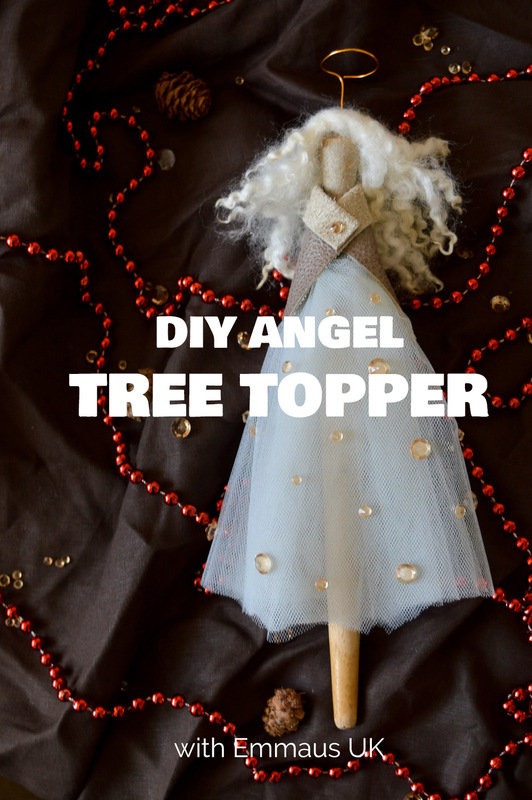 To store, I recommend using some newspaper or bubble wrap up the skirt as well as wrapping it around the angel, to help the skirt keep it’s shape. Whether it’s for Christmas, a birthday, or just because – I can’t recommend shopping at your local charity shops enough. Emmaus UK supports formerly homeless people by giving them a place to live and meaningful work. What’s your all time favourite charity shop find? Full disclosure: I was invited by Emmaus to visit a store and select items for a crafts project. Although I was offered to take the items for free as part of the deal, I chose to pay for my items in support of the work that they do. Sweet! Thank you for this idea!